What are CU Spirit Days? 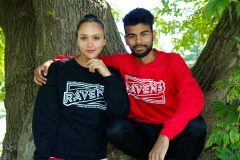 The CU Spirit Day program is a collaboration within the Carleton community to help promote Ravens spirit among students, staff and faculty! Spirit Days occur every Friday across campus. Wear your Ravens gear to receive exclusive Spirit Day benefits and promote Ravens pride! Every member of the Carleton community can cash in on some sweet Spirit Day perks when they wear their CU gear and represent our great school! Review the 2018-2019 Perks! 2019-2020 perks to be announced later in the summer! It pays to be a Raven, especially on Spirit Day! Show your pride and purchase the 2018/2019 Official Spirit Day Crew Neck Sweater! You get all the CU Spirit Day benefits and $2.00 from each shirt goes to Carleton’s Here for Good campaign! The Here for Good campaign is a philanthropy initiative that focuses funding to improve the economic, social and common good of society. To learn more about there Here for Good campaign or to donate click here. Be sure to check out the SEO, CUSA, Abstentions or Athletics starting August 20th to pick up your Official Spirit Day Crew Neck Sweater for $10! The Carleton Spirit team wants to reward you for showing your #CUSpirit! Keep an eye out for the CU Spirit Team every Friday across campus! They’ll be looking for students, staff and professors showing school spirit and wearing their Raven’s gear.